...if you've come here from a link I've left on a comment, but I find that if I sign in with name and URL, I don't have the option of subscribing to comments, so I still use my Blogger sign-in. My blog has moved here. Same name, same furniture, different address. 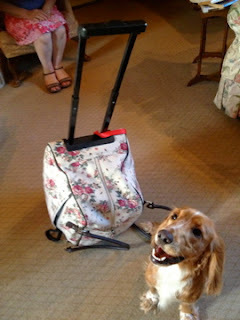 This morning, I packed Rupert's bag while Russell took him for a walk, and I think it's time to pack and go here too. I'll leave comments on here for a few more days so that you can tell me if you have any difficulties with logging in over there. However, all posts and comments have been transferred. I need a Blogger or similar ID to be able to comment on many sites so this blog will stay here as it is. If you haven't visited it yet, please drop in, you will be very welcome. If you would like to leave a comment, you need to register with a name of your choice and an active email address, where you will be sent a password - you then sign in with your username and password and if you tick the box it will remember you. You will get a profile page but you don't need to do anything on that - however, if you wish comments to appear under a different name than the one you've entered, you can add it and if you want a different password, you can change to one of your choice. Any difficulties, please leave a comment here while they're still switched on, or email me at the address on my profile - oh, I see my profile has vanished. Just click on Z and look for 'contact me.' Please don't sign in with your Wordpress, Blogger or any other password, just with your own name or blogname and your email. No outside agency has any access to your details or comments. See you at http://razorbladeoflife.co.uk/. And if you have been, thanks for listening. 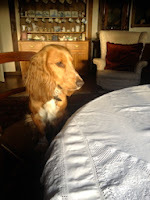 This is our final day with Rupert, our friends' little spaniel pup. Sam and Hannah are due to come and pick him up tomorrow morning. The visit has been an unqualified success - which we expected, no problems were anticipated - and the only slight disappointment has been that we've not been able to let the dogs out in the garden unaccompanied, just in case any of the bantams have got out. But they can go off the lead on the marshes, where they have a brilliant time. They both love the water and play riotously, but with complete good humour. Ben is very kind to the smaller dog, although sometimes clumsy, but Rupert is quite unbothered at being trodden on and can hold his own in a play-fight. He is also very, very affectionate and cuddly. Although he woke early this morning and wanted to play, which I could have done without, having been fast asleep at 5.45. Other news on the home front is that Weeza and Phil's house purchase seems to have had all problems ironed out and the contract is due to be signed tomorrow, with completion early next month. There's a bit of work they want to do before ﻿moving and more in due course, but it's going to be beautiful. ﻿If anyone is having difficulty registering here, do let me know (my email address is on my profile here) and I can do it. If you want an avatar/photo against your comments, I think it'll work if you add your own blog to your profile. The advantage of commenting there is that it will be published immediately, with no need for me to approve it. Also, though Ro has succeeded in uploading all comments, further ones won't be taken over from here. I shall turn off comments here when I stop updating on this site in any case. 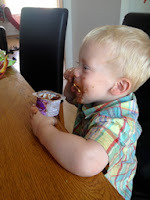 I've had a few queries about comments on the new site, so have checked with Ro, who builds websites for a living (Senior Interface Developer, he is - I suppose it's inevitable that at least one of my children should have a job title I don't really comprehend) and uses Wordpress regularly, which he says is excellent. The new blog is not a wordpress. com blog but a stand-alone site that uses WP tools. So a Wordpress ID doesn't work to sign in with, you need to enter in your details to register. Categorically, wordpress.com does not have access to comments on razorbladeoflife.co.uk and there is no crossover. If you register, your comments won't appear anywhere else and they won't be available for marketing or spamming. I'll post on both sites for a few more days and then just leave a link here. Ro has transferred all the posts and pictures and some of the comments, but there are about 28,000 of them and it's straining the system a bit. If you read blogs on an iPhone, it's a lot nicer on the new site and the commenting is easier too. Many, many thanks to Ro for setting this up for me, the site itself wasn't so much bother (though I kept going back to him with little points, mostly about the commenting set-up) but the transfer of 3,000 posts was and it took him the whole evening. He has been extremely kind and patient throughout and I appreciate it all very much. 'Want to do' - ah, there's a thing. There are things one might yearn to do but know the opportunity might or will never arise (a friend of mine has hankered since childhood for a trip into space, but I think she will never have the chance), things that one intends to do, things one hopes might happen. I tend not to wish for the impossible and I don't even plan ahead that much, but will take an opportunity if it presents itself. A friend (a different friend, in fact it's Rupert's owner's mother) took a break from her job as a teacher while her children were small and, once they started school, decided to learn some new skills. So first she learned Japanese and then photography and took a GCSE in each. I can see the point of the exam in those cases because it was a measurable mark of success, whereas I refused to take exams when I was learning the clarinet because, if anything, I felt it would hold me back. 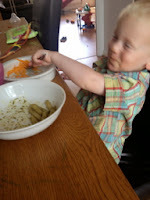 1 Get the new blog up and running, with vast appreciation of Ro's help. 2 Take the CBT (Compulsory Basic Training) on a motorbike. What I then do with it will depend on how much I really enjoy it, but it's a challenge I seem to have set myself without quite realising I was going to. 3 Continue with the social life and doing things for pleasure. I've been doing pretty well at this all year, it's something that usually drifts during the spring and early summer. I start with good intentions in the autumn (I go by school years still more than calendar ones) but, when busy, it's the things you want to do rather than the things you must do that slip first. I have got something vital on at school that needs to be prepared for this month and done in the first half of next and I'll tell you about it in due course, but then I have two holidays booked, one with Wink and one with Nadfas and I've arranged to go and visit Badgerdaddy in October too (and hope to call on John G on the way, though I haven't let him know dates yet). Then Wink will be having an operation and I'll spend quite a lot of time with her. So, though I might not manage many social things at home, I'll be doing them somewhere. 4 On my 'I'm going to bloody well do this because I'm not a wuss' list is getting over this ludicrous inability to be out of my depth, literally. Fear of water has to go, it's not going to govern me much longer. 5 At present, though it'll probably last all of another month, my nails are looking okay and I'm putting stuff on to strengthen them. They are dreadfully weak and when they break, I neglect them in despair and then, when worrying in the dark reaches of the night, I bite them. That is a shaming admission from someone of my age, but if Roses and Mig can stop smoking, I can stop doing something I should have grown out of half a century ago. As is sensible with a 'to-do' list, one should always have an item that can be ticked off pretty quickly. So, though it's not yet quite finished, here's a link to the new blog. Which will include the whole of this blog very soon, I trust. I might post on both until I'm sure what I'm doing over there, but then this won't be updated any longer and there will just be the link to that, though the archives will remain here too. On the new blog, I'm afraid you'll have to register once to leave comments, but just with your chosen name and an email and then you won't have to do it again, there won't be a wv and it will be published immediately. Hope it all works ok, let me know about any problems. Ronan says that it's always possible the whole thing may go awry when he uploads more than 3,000 posts from here to there and he may have to start again, though he hopes not. So do I, it's not as if this is a hobby for him and he's being very kind as it is. It's rare that I buy really casual clothes. I never had a lot of money to spare for myself, having had children very young (the advantage of that is that they can fend for themselves by the time you're in your forties), and what I did have went on books and music. So it seemed wasteful to spend what I had on anything that wasn't good. So no dungarees - though being short and having the firm, if completely erroneous belief that I was stubby, I'd have assumed they wouldn't suit me in any case. And platform shoes - no, didn't like them. I went without new shoes until they went out of fashion because all shoes for young people had them and I was stubborn. We had a good many dogs when I was growing up, and no cat dared enter our garden. Russell won't have one, being a bird lover - I know that not all cats kill birds but he wouldn't take the risk. I rather like cats and wouldn't mind having one, but I don't know if we'd suit because I'd make a few rules. The first one would be no creatures brought in to the house, dead or alive, the second would be no cat is allowed on a place where I prepare or keep food. I have no comprehension of people who, otherwise hygienic, allow a cat on their kitchen table. If you're not hygienic, fair play. The hotel I was born in and where I lived for four years was 1930s. Since then, I lived in Edwardian houses until this one, which is some 450 years old. I don't mind the idea of a new house, it's just not likely to happen. It seems that blogging was made for me. If I didn't have a blog, I still don't think I'd keep a diary, except the appointments one - and I'd not willingly go back to a paper one, at that, The phone is far more convenient. Yes, I hope I will travel more. Russell's passport runs out in December and he's never used it, and only used the previous one once, so travelling will be done alone or with friends/family. I think it's very good to be self-reliant, though. My dear stepfather, Wilf, had a son but, although I know his name and that he used to live on the Isle of Wight (and still may do), I know nothing more. I think he'd be in his mid to late sixties now. 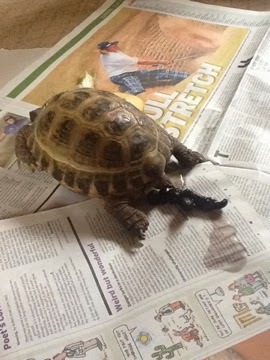 The surname is Edwards, which wouldn't make tracking him down very easy - but then, why would I? Wilf hadn't seen him for many years and he died more than 25 years ago. I let it go. Never had the opportunity, except by displaying a very untypical exhibitionist streak. If I had my own swimming pool - but that's extremely unlikely too. Besides, I don't like swimming pools and I'm afraid of being out of my depth. If there's a fear waiting to be conquered, that's it however. I was never a runner and, since finding out about my congenital hip problem, that's just as well. If I'd been very sporty, I'd have needed a new hip in my forties. I'd hate to be in a marathon, too many people. When I did run, it was on my own. Bungee jumping - blimey, no. It would dislocate my hip now, but I'd never have done it, not for anything. I'd have jumped out of an aeroplane if required, no objection to that - but not now - hip again, I'm afraid. I married from home, so never lived alone. Apart from the obvious awfulness of the reasons for it happening - ie death or divorce - I could well imagine, if things had been different and I hadn't remained married for forty years, that I'd like living alone. If my children had been younger, they'd have read Harry Potter and so would I. But I've never had a reason to. I daresay I will, one of these days, probably when a grandchild lends me their copy. And maybe one day I'll catch a film on tv and it won't be on Christmas afternoon when I've spent all morning cooking and then eaten too much, so won't go to sleep in the middle of it. I should write a 'want to do' list next - as Sir Bruin surmises, little of this will be on it. I seem to remember that the last time I mentioned things I'd never done, they included being on a motorbike, and we all know where that led, and is still leading. All the same, here are some more nevers. I have never worn dungarees or shoes with platform soles. Russell has never worn jeans or a teeshirt. I have never lived with a cat. I have never lived in a new house. I had never kept a daily journal (as opposed to an appointment diary) for more than a few months until I started blogging. What a transformation! I have never visited Scandinavia. Nor the Americas, nor Australasia. I don't get out much, frankly. I have a stepbrother whom I have never met, and I don't see how I'm ever likely to. I have never swum naked, and that's another really unlikely one. I have never run a marathon, bungee jumped or parachuted and I never will (forbidden on medical grounds). I have never read a Harry Potter book or seen one of the films all through (when one is on at Christmas, it has always sent me to sleep). This is no boast but a simple matter of fact. Roses came over today for lunch, though we didn't eat it until late, what with one thing and another. We drank wine, made a bonfire and walked the dogs. And talked, of course. Tail end of the bonfire. Ben and Rupert. And Roses. And my contact lens has gone to the back of my eye again. 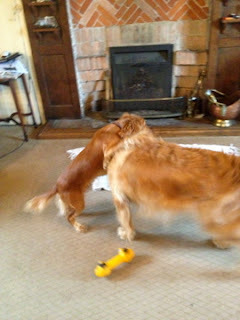 I was just putting it in this morning when Russell sharply told Rupert to stop (chewing Ben's cuddly bone). I looked up and it vanished. I'm a bit fed up. It took several days, last time, to re-emerge. It seems to do no harm, it's just uncomfortable and I will have to wear glasses, which is a nuisance. I hate the barrier that glasses give when I'm talking to someone and I can't read or do anything much except see with my distance glasses on, so have to keep putting them on and off. Gus is much better, thank you. Weeza is taking him back to the doctor tomorrow as arranged, but we're all hopeful that the medicine will do the trick. We'll go over and see them at the weekend, taking Rupert as we're sure the children will love him. I knew I was due to pay the balance of my October holiday within the next few days, but couldn't remember the due date, the amount I owed nor the name of the travel company. I'd received confirmation and an invoice of course, and carefully put it in a sensible place. Lord knows where. I couldn't find it anywhere. Luckily, I had sent details of my renewed passport by email so was able to find the name of the company, so I phoned and came clean and the nice woman on the telephone looked me up. Soon afterwards, the internet connection went down. I went through all the correct procedures to try and restart the hub, but no joy. I phoned to check there wasn't a local issue and this exchange wasn't mentioned, then phoned the helpline number and was put in a queue. 10 - 20 minutes, I was told, so got on with things while I was waiting. After a while, I thought I'd better just check - and the internet was on again. I dunno. Some sort of glitch at the exchange, I suppose. Still, at least I didn't have the embarrassment of finding out when on the phone to the broadband guy. We're into our second and last week of Rupert's stay. It's going very well, he settled down pretty quickly. Hannah left a shirt of hers that she'd been wearing, on my suggestion, to console him when he missed her and he took it to bed with him the first night. He does carry it around with him, but not every day. I'd hoped to let the two dogs out in the garden together, but bantams fly over the wall into the garden sometimes and I don't want to risk them being chased. So they're getting walked on the lead, for the most part. They get plenty of exercise chasing each other over the house, it's doing them no harm. I had been letting them have a run on the marshes, but Jonny has let the cows onto the first marsh now and I don't take the risk. I've no idea how sensible Rupert would be and fear of him running up to them and being swiped off his feet by half a ton of cow is making me cautious. Time for our late-night trot round the village. I like going out in the dark, though I take my phone in case I need some light. The other night, they found a hedgehog and were very interested. Luckily, I realised and pulled them away before they picked it up - well, Rupert isn't big enough, but Ben is. And I'd have had to spend the next hour removing fleas, I daresay. Gus was no better this morning, so I sent Roses an apologetic text, asking to postpone our meeting, which she readily agreed to, I walked the dogs and put the washing machine on and headed off to Norwich again. Weeza had decided to take the day off work and work tomorrow instead (she works three days a week but there's some flexibility) and I was going to help occupy Zerlina. and later decided to walk to the village shop for ice cream and then go to the playground. Fortunately, we took umbrellas and coats because we needed them for a while. I also remembered kitchen paper towels to dry off the swing and slide, and that was needed too. We were out for a couple of hours and Gus slept most of that time and was still asleep when we arrived back. Weeza had booked a phone call with the doctor and he asked her to bring Gus in to the surgery in the afternoon. He was quite concerned that Gus was still ill and decided there was a secondary infection subsequent to the attack of croup. He reckons it's bronchiolitis and has prescribed both steroids and antibiotics to relieve the symptoms, and has made an appointment for Friday. Poor little Gus, he tries so hard to remain cheerful throughout it all. And Zerlina has been a little darling, really helpful and loving. Their lovely childminder Lynda only has a couple of other children tomorrow, so is willing to take Gus and give him a quiet day, but if Weeza doesn't feel he's up to it, I'll go over again. She did pop in to work for a while this afternoon to do some vital air ticket bookings for her boss, so can take a short day tomorrow. Russell has been very good-natured about holding the fort back here and doing all the dog walking, apart from first and last of the day. I was more disappointed than surprised when I got home at 6.45 tonight, to find he hadn't bothered to unpack and restack the dishwasher in the course of the day, but it didn't take long, once I'd fed the dogs, prepared dinner and laid the table. H'm. It was Nick who pointed me in the direction of this article and I found myself invoking the rodents of disbelief as I read it, rather as he did. Yes, journalists are censorious and Bronwen is a journalist, but surely no one feels the need to take the sort of expectation she describes seriously. I think she's taking as much as a stance as these fictional 'perfect' mothers and I found the article pretty trite and not especially well-written. But I don't have to churn out a weekly column for a living and I can quite see that a chance remark sparks off a train of thought and, perhaps, that one is drawn into a more vehement expression of opinion than the matter actually warrants. So I shrugged and moved on. Except, that it reminded me of the early 1980s, when there seemed to be great pressure to be busy all the time. It was a common occurrence, that a woman would declare that she was constantly on the go and that she felt guilty if she ever took a break and sat down with a book or did anything for herself. In saying how wrong she was to take this attitude - 'my problem is, of course, that I'm a perfectionist. I'm just too conscientious' - the more vehement she was, the more she was actually boasting about it. And others would agree with her and they'd all declare how stressed and busy they were all the time. My answer was not an affectation because it was true, but I have to admit that it was deliberate - I intended to wrong-foot - when I reacted with great sympathy. I needed loads of time to myself and would happily leave the washing up if I wanted to read a book, I declared. "It all gets done in the end. I don't feel guilty because I'm not doing anything wrong." I wasn't being entirely naughty, I did mean it. There was a prevalent feeling that a woman had to do everything and many young women felt guilty at the prospect of employing someone to help in the house, even if they worked full time and had young children to look after too. And some of them couldn't afford not to be constantly on the go, and I don't mean them, they just got on with the work and didn't talk about it. It was the ones who boasted about a level of stress and busyness that I knew either wasn't true or wasn't necessary that irritated me. 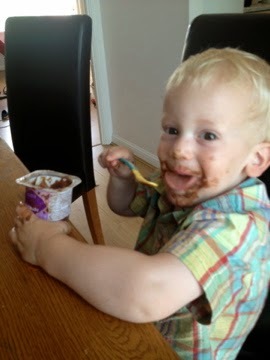 I looked after young Gus today. As I said a couple of days ago, he's had a bad attack of croup - it's an infection going round, apparently, though he's not infectious any more. But his mother had something on at work that she neither felt able to miss nor to cancel and I was free, so I headed over there this morning. And it was the easiest babysitting I could have had. He stood for some time watching television (yes, I have no hesitation in using the soothing powers of children's tv once in a while) and then I realised he was leaning heavily on a table and nearly asleep. 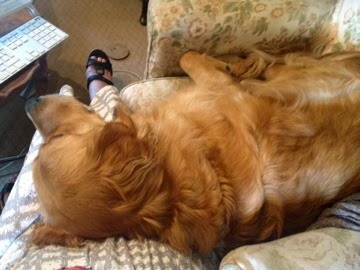 So I scooped him up and sat him by me on the sofa and after a while I suspected he had gone to sleep. His breathing was very wheezy and I couldn't recognise the moment when he did actually sleep, I had to use the camera on my phone reversed to see his face. And he slept for an hour and a half from the time I realised he had dropped off, so it was longer than that. He woke at 1 o'clock, so I gave him a drink and went to find him some lunch. Not having expected him to be home, there wasn't a lot in the fridge, but I gave him some grapes and cucumber to keep him going and then grated him cheese while I cooked some pasta. 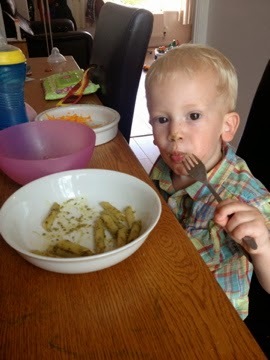 Pasta and pesto, the great standby of the modern mother. He ate a lot of everything, he was very hungry. And he cheered up by the minute. So, since he'd cleared his plate, I offered him a chocolate mousse that I found in the fridge. And that made him really happy. 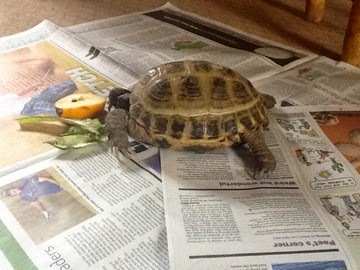 Rupert also sits very nicely at the dining table, by the way. Weeza rather enjoyed her meeting. We emailed each other every so often during the day and she said, at lunchtime, "I'm just back from my trog around the estate - 2.5hrs we were poking about hedgerows!! Excellent stuff though - I love hearing old boys talk about 'back in the day.'" Very like her parents, is our Weeza. Long-term readers will know that I sometimes start telling you all about my family's or my own past. I've pretty well run out of things to say now though, and I've been telling one of my friends about another family I've known since way back. I've got quite a few anecdotes - you know me, not brief funny stories but fairly long ones that ramble on and on with multiple digressions until, at the point where the reader reaches total despair, I return to the original point and complete the tale. Sadly, I can't possibly post any of it here (not because it's rude but because it's not appropriate, they're not my relations), but it does make me realise how much I enjoy this sort of reminiscing. Odd really, because I've never done it within my family, I've written more here about my childhood than I've ever told my children. Still, if ever they're interested, they can read it here. My friend probably wishes she'd never asked, mind you. I have, with uncharacteristic boldness (if you'll believe that, you'll believe anything) given Elle a link to this site. It'll be news to her that I call her Elle, for a start. Today, I've been buying cashmere. Well, it's the time of year, innit? When it's cheap. Two good quality (I've bought from them before) cashmere jumpers for £55 including postage is fine by me. Weeza phoned this evening and we realise we haven't seen each other for several weeks, so we're planning to meet up on Friday. Their house-buying is still ok, they've had a few concerns about the vendor but it seems that it's on track and they hope to sign the contract this week. Fingers crossed. 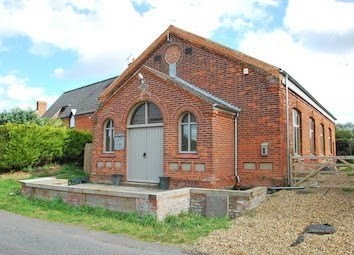 There's a fair bit to do with the house, which was formerly a Methodist chapel and the conversion was never quite completed, but it's got great potential. 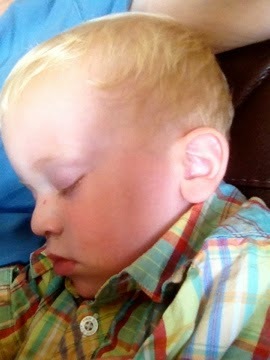 Poor little Gus has croup and was quite ill this afternoon. In fact, he was wheezing so badly that when Weeza (sorry, I should call her El on this occasion) phoned the NHS helpline, they offered to send an ambulance and, when it arrived, he was given oxygen - not because he was in danger but to ease the symptoms. At the hospital, he was given steroids and is asleep in bed now, although still quite wheezy. If he's not better by Monday, I'll go over and look after him for a while in the morning as El has a meeting that she'd rather not cancel because people are coming from some way away for it, and she will take the afternoon off. I've been exchanging emails with Elle - ah, there's why it's not too sensible calling my daughter El. Our student friend who stayed over here for several months, if you remember - her parents and sister came over in February and she returned home with them. We've talked on Skype but really not kept in close contact, considering what close friends we became. Anyway, in apology, because I'm really rubbish at replying to emails, I've offered to tell her the name of my blog. Yes, I know. I never mentioned it when she was staying here, but now I've blabbed. Some rain this evening, but not the thunderstorms that other places have had. Not very dramatic on the whole, East Angular. I took Ben to the vet yesterday for a routine vaccination. By the time I came out, with worming and de-fleaing stuff (no reason to think he has either worms or fleas, just precautionary) and a new harness, I'd spent the better part of £100. H'm. He likes the harness much better than the Halti though and it seems okay, though if he really pulled I think it wouldn't be quite as effective. He doesn't normally, he's pretty good except if he sees something and suddenly takes off, such as a dog friend of his. It's a bit of a nuisance to put on, but at least he doesn't run away when I pick it up, as he does with the Halti. While I was in the waiting room, I weighed him. He weighs 42 kilos. That's nearly 93 pounds, 6 stone 9 lbs. H'm again. That's quite a lot of dog. More than four times the weight of Rupert, less than two stone lighter than I am. And he's not keen to get into the car, I have to lift him, half at a time. I didn't finish the crossword today because friends called round and we stayed in the garden for a long time chatting, but did anyone else find today's Times crossword particularly easy? I filled in half of it in ten minutes flat - and since I sometimes stare helplessly for at least that long before solving the first clue, it was unusual. I'm not as good at cryptic crosswords as I used to be, sadly. I don't know if it's my brainpower that's diminished or if I don't get enough practice. Both, maybe. H' - oh, I'm repeating myself. There's another thing with Blogger you see. There doesn't seem to be a way of making the photo at the top any smaller. I've ticked the 'shrink to *whatevs*' box already or it would be even bigger. This is just a picture taken on my phone but the only way I can find to make it appear smaller here (I've tried before doing it on the computer before adding it) is to email it to myself and sending it as a smaller file. There's a choice of sizes of pictures you add to the post, but headers are not so adaptable. It's just choice I want, and I realise that there's a limit to what I can expect from a free service. Anyway, what you will have realised it that we're a two-dog family for a couple of weeks. The first night went well, the only drawback being that my bedroom windows start at knee height because the ceiling is low. So I couldn't leave the window open in case Rupert jumps out. We'd already decided he couldn't sleep downstairs with Ben, they'd play all night and Roop might whimper for his family. So we didn't sleep a whole lot, but only because we were so hot - if it is as muggy tonight, I might move into the spare room where the windows are much higher. What is it with puppies and paper? I had a clean tissue on my lap - I'd just used it to wipe a mark from the screen and Rupert jumped up to say hello and stole it. He and Ben are demolishing it on the carpet now. Ben has an appointment at the vet's for a vaccination this afternoon. It'll be fun getting him into the car on my own. There have been a couple of anniversaries this week. On Tuesday it was the 27th anniversary of our move to this house and yesterday was Ronan's 29th birthday. Yes, my baby. He's the tallest member of the family and an absolute delight. Years ago, I asked him if he ever remembered quarrelling with his elder brother and sister, because I'd never seen it. He considered the matter and agreed that he didn't think he ever had. He was a difficult small baby though, not at all easy to please. But once he'd grown up a little, I realised why. He is a communicator and he was frustrated. The moment he learned to speak his first word, he was a changed child. "Dah" was it, and it meant 'water.' And water is such a useful word. Whether you're thirsty, if you go for a walk by the sea (we lived 100 yards from the beach then), if it's raining, if you're having a bath, there are so many opportunities every day to say a word that the person you're with will pick up on and make into a conversation. And, of course, you say it twice and your father is really pleased with you. And the more he grew up, the more delightful he became. Lovely young man. Happy 30th year, Ro. I'm going to be moving from Blogger sometime soon. I've got as far as buying razorbladeoflife.co.uk, but don't bother looking there yet because there's nothing to see. Ro is lending a hand and I've explained my requirements, which mostly have to do with comments. I don't know if we'll find a way of sorting it all out from the start, but this is what I've said. There must be a way of subscribing to comments, I don't expect people who respond to a post to have to keep coming back to see what else has been said. They shouldn't have to belong to Wordpress, Google or anything else to leave a comment. If someone says they will subscribe to comments, I don't want them to have to say it again in an email, especially one that starts 'Howdy' (Wordpress). I want them to be able to put in the name they want to be known by - I sometimes have to put Zed because Z isn't long enough (Disqus). Once they leave a comment once, I want their details to be remembered if they wish, so that they don't have to fill it all in again. It's no good ticking a Google identity box if you don't want your full name going into the comment box and a guest signing-in isn't remembered (Disqus). Regarding the blog itself, I want to be able to move all posts and comments too. I don't think any of this is a whole lot to ask, but we'll see. I heard on the radio recently that MySpace has just had a relaunch, but those who blogged on it had their entire blogs wiped, with no warning. I'd have been devastated, frankly, I love my blog. The dog just nudged the keyboard, with the result that Neutral Milk Hotel is playing on iTunes, all unbidden. In the Aeroplane over the Sea was one of the albums that Ronan bravely loaded onto my new iPod several years ago when I asked him for his chosen music, out of absolute respect for his taste, albeit with no knowledge or understanding of what he liked. This particular album took me quite two years to appreciate, but I did come to it. It's not been the most tranquil day because events conspired to prevent me from finishing an Extremely Important Letter, but I finally got to grips with it this afternoon, even though it meant I had to ignore some visitors for a while, with due apologies - I should say that they were really visiting Russell in any case. My reputation for writing effective letters for any and all occasions haunts me somewhat, but not enough to stop me doing it. Anyway, Mimi and her mother Lottie arrived this evening and we sat outside, somehow sinking nearly three bottles of wine between us, not that Lottie drank much at all because she was driving home. It was generally agreed that Russell drank most of it. My mother was exceptionally friendly with them both and shared a birthday with Mimi, albeit several decades apart, but they loved each other. It's rather lovely to think that Mimi is sleeping in Jane's bedroom tonight, Jane would be so happy to know it. I suddenly discovered yesterday that the front path to the annexe was quite desperately overgrown, but luckily a friend was able to help out with his strimmer tonight and it's all magically been cleared. I didn't take pictures of that but I've just remembered those I did take. 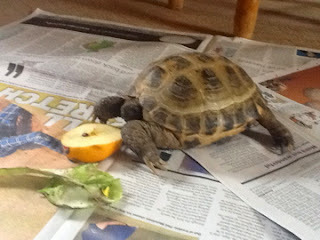 Al, Dilly and Hadrian called in this morning and Hay wanted to see the tortoise, so Russell went to get her. I warned about her reaction to being carried and provided newspapers ... oh, sensible Z. I'm afraid I was intrusive enough to take photos of Edweena's bodily functions. If you are sensitive about such matters, please look no further. *sure you want to read this? M'kay* Photos as they was took. It all started innocently enough, you see. Edweena noticed the apple and moved towards it. But she'd already done a little wee and soon a Number 2 followed. And it all got remarkably - well, there was a lot of it. And then, when we thought she was all done, having wet the paper again, she suddenly flooded it. I'm afraid we all laughed like drains, especially Hay. I will never hold Edweena without taking precautions, being dangled starts her off. And this afternoon, one of the bantams appeared on the lawn with two fluffy little chicks. She is extremely cross with us because we've put her in a coop, to save them from possible attack from magpies or other predators. But it's her fault, she should never have laid away. I did most of what I planned today (one job is still waiting for me), but not at the time I had intended. Because it was hot and, though I can't sunbathe, I love a glorious summer's day. So I dressed in a particularly pretty frock, did necessary tasks in the morning, went in to school for a final meeting with the Head - just a few loose ends to tie up, nothing much - and went back home to cut back the creeper from around the windows, ready for the wood to be re-stained later this week. But Russell was going out so I couldn't do the upstairs windows with no one to hold the ladder. So I defrosted and emptied one of the fridges (the other is now crammed full) and, after lunch, took a glass of quite low alcohol beer and the newspapers out into the garden and there I sat for - oh, hours. I don't know, two or three. I had a big hat on and a garden parasol and I was rather too hot, but winter carried on for so long, you're not going to catch me minding about a bit of heat. We have moved the fridge and it's settling down ready to be turned on tomorrow afternoon and I shinned up the ladder and cut the creeper, so no harm was done by my afternoon off. Cooking is exceptionally simple at present, now I don't have the Aga on. The tabletop cooker is no pleasure at all to use, though it works perfectly well. So I just prepared a couple of trout en papillote and served them with Norfolk samphire. And then we had some Suffolk raspberries. There's an advertisement on the television with dogs and Ben has his nose pressed to the glass. He'll be so pleased when Rupert arrives on Wednesday night. Well, friend Barry was surprisingly supportive too - no one has yet come out with anything startled about my hitherto completely hidden yen to be a bike rider. He's suggested I go round to see his bikes - he has three on the road of various sizes and types and another which is currently off-road, and told me about the training and tests I would need. I've also read about it, thanks to Sir Bruin, because verbal explanations don't stick in my mind as reading them do. I've mostly got the bungalow ready, though I still haven't made the bed and I need to take a fridge through there - we have two. I'll have to empty one of them into the other, which will be a bit like Roses moving from a three-bedroomed house into a two-bedroomed flat and hoping everything will fit in. Oh, and the china that I found (I wondered where I'd put all that blue and white stuff) is now in the dishwasher. I also managed to find the extra keys that I'd had cut and then put rather too safely away. The autumn is going to be pretty busy because I've got two holidays booked and, because my sister is expecting to have an operation, I'm also planning to spend quite some time with her, very likely travelling up and down to catch up with things at home. I'll probably not mention dates or tell you when I'm away because, although family will be here with Russell some of the time, he may be alone at others. Blogging may be spasmodic or on general topics and I'll tell you about the holidays later. 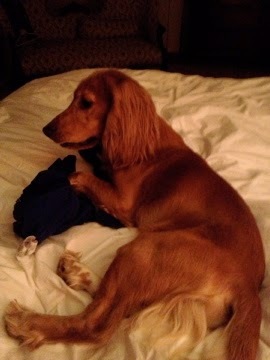 I was talking to Rupert the spaniel's owner today and she says he now sleeps on the bed with her and her husband. Actually, it may be simplest if that's what he does while he's here too. When he was little (he's now eleven months old) he slept in a dog-cage, but that hasn't been the situation for a while and I've a feeling that he and Ben would play half the night and keep waking us up. If Ben is downstairs and Rupert is upstairs, it should be better, especially if he frets without them. I don't mind, when I was in my teens I slept with three large dogs on my (double, fortunately) bed. My dogs have always slept downstairs, though Tilly used to come in the bed for a cuddle first thing. You can tell, can't you, that I have work to do? It'll get done, though possibly not until midnight. I spent some time pottering back and forth with everyday essentials to the annexe. I haven't made the bed yet, nor found suitable china, but most of the rest is ready. Mimi will be arriving on Tuesday sometime. It's just occurred to me, however, that there isn't a television through there and little hope of an internet connection - when we had our recent upgrade, we moved the hub into this room and, though the connection is better and stronger, our thick walls mean it doesn't travel too well and we do need a booster. It's not even too good in my study - it does work but has a tendency to cut out once in a while which is a real pain when filling in forms or paying for something online. I can get round both of those by telling her she's welcome to come through here, of course, but it'll be at the expense of her and our privacy - not that this is a bother to us, I don't know how she'll be about it. I'd better ask Ro's advice about the wifi. And I have been meaning to buy a tv for next door, though with no sense of urgency. I'm going to need to be talked to, I think. Right now, I'm not only inclined to have a birthday party, but to get a motorbike too. I've a feeling I've got to make the most of the remainder of my not-quite-dotage, having led quite a sensible life up to now. It had always been my intention to take up a vice in my fifties - well, earlier. Once Ro reached the age of 18 and I no longer had to be a Good Example. But I couldn't think of anything I wanted to do and the moment passed. But whilst time is, if not actually on my side, not my enemy either, I feel a need to do something I've never tried before. I probably need to be talked out of all this. Weeza, mind you, has been surprisingly encouraging. I was talking to someone about disingenuous insults, in respect of people who take their hobbies or lifestyle a bit too seriously. We came up with a few examples, I wonder if you could add to them? In the usual way, I'll add them to the post if you can. I've been given a number of letters to write over the last couple of days. It's a bit startling, so late in the term, but I've got two of them done and the others will be written over the weekend. It's an interesting exercise as they all need slightly different styles. My formal letter-writing is nothing like what you read here, I take a lot of time and trouble over it for a start. Here, darlings, you get spontaneous (yes, that's the kind word) writing that breaks as many rules of English as I like. I'd never start a sentence with 'And' or 'But,' never end one with a preposition, though nor would I fall into the 'up with which I would not put' trap either, not use colloquialisms nor keep reusing the same adjective in a proper letter. This evening, I raked up the dry grass that had been strimmed from the verge down the drive and dead-headed delphiniums and roses, as well as doing the nightly watering of pots. It was a mark of relaxation and of having some time to spare - that is, the weather was too lovely to waste by getting on with things indoors. I did spend a while finding cutlery and utensils for the annexe for when Miriam comes to stay. I'm still thinking about china and hoping to dig out something suitable from a cupboard. She could have some of ours but I'd have to borrow it back if the whole family comes for lunch. I have to admit, this is not very likely while the Aga is off, though I suppose I could do a cold meal with salad. It's Ro's birthday next week and, now he's a home-owner, I'm buying him a domestic-type present: ie a barbecue. I'll pick it up tomorrow, having reserved it in the shop. As you know (well, most of you do), I've resolved to ignore my birthday, which is in about six weeks time. But I'm weakening a bit and wondering whether to force friends to 'celebrate' with me after all. Not on the day, I've got a meeting, though I've ascertained that someone will bring CAKE! I've only ever had one birthday party since childhood and that was my fortieth. I had the urge to celebrate, I'm not sure why. We've only ever had one anniversary party, other than family ones, and that was a surprise one thrown by the children for our 25th. We ignored our fortieth anniversary - on the whole, it all seems rather artificial and I don't mark specific dates. And I really don't like a fuss being made over me. I prefer parties that aren't centred round a 'me' occasion. But I'm a bit conscious of how short-lived my family tends to have been and I know that it's daft not to grab every opportunity to have fun with friends. I dunno. Still undecided. Still, if you have been, thanks for listening. We've been minding friends' dogs for the last few days - that is, Russell cheerily offered to have them here, but I pointed out that we'd find it quite difficult to manage the three of them when there is nowhere to let them have a run. Ben has a wired area behind the annexe, though we take him round there on a lead when there isn't time to let him go and wait for him to come back, but Molly and Maggie would jump out and Molly, though a sweet-natured dog in many ways, is a chicken-killer and we couldn't take the risk. 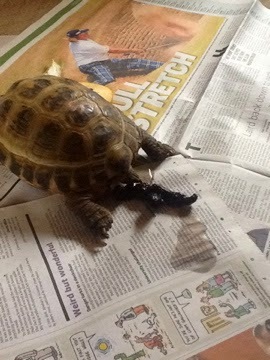 So we've been going over four times a day to let them out in the garden. In addition, they'd got the dates of their friends' holiday wrong - they've been looking after another dog - and so we also had Mister to look after. And a cat. It hasn't been the easiest week to do it, as we've both been quite busy, but we've managed it between us. The owners have been in Liverpool at their daughter's graduation - she's now a qualified vet, having reached the culmination of years of study, so it's been a big family celebration. I showed governors my scary side today, not that it was directed at anyone there. A letter from an English teacher (not one of our staff) had three errors in the first three paragraphs - that is, one clunking infelicity, an error of usage and a grammatical mistake. I was rather scathing, I have to admit. I'm only pedantic when circumstances dictate - I'd have let any of them go if it had been a dashed-off email, for example, or if it had been from anyone but an English teacher - but in the circumstances, it really did matter. Much as I'm enjoying the heat, I can no longer stand the kitchen. So the Aga has been turned off. I miss it already. To the dentist first, and I'd sent Ro a text suggesting we meet for lunch afterwards. His office is in the city centre and his lunchtime is flexible, so he was fine with me saying I'd text when I was ready. However, I waited and waited - there were two emergencies, one was a broken tooth and the other was someone else's patient and there was a mix-up - I was out a good half hour later than my latest estimate. Still, never mind and my teeth (and mouth generally) have a clean bill of health. And for the twenty-hundredth time, I thought how lovely my children are and how lucky I am to have them - we all get bogged down with the small child thing and the teenage angst, but grown up children are the best thing ever and so are grandchildren and I make no apology whatsoever for being sentimental. And then I went on to a tea party, which I thoroughly enjoyed, and later was off to Squiffany's school to go to her play, which was jolly good indeed. I'm not being partisan, I've been around schools a lot, and they were really good. Those who were overdressed for the heat must have suffered, especially the one in the horse costume, but they were troopers, or do I mean troupers? No, surely the former - blimey, I'd have been confident twenty years ago, I'm becoming illiterate with age - anyway, they battled through smiling and taught the audience a dance at the end. Yes, I joined in. No, Al and Russell didn't. Blokes, hey. And now I'm home again and we've eaten dinner and I've got work to do. But it's the day the cleaners came, so at least there's no housework except the daily stuff this week. And a friend's daughter - well, the daughter is a friend too - needs somewhere local to stay for a few weeks, so of course we've offered the annexe. So things seem to be okay, except for having paperwork at half past nine at night - but the sooner I start, the quicker it'll be done. Shall we say the deadline is 10 o'clock? I'll set a timer. *was the name of the play. There were a good many documents to copy and send out to governors today so I went in to help. I got a papercut in the first couple of minutes, of course, and bled over a sheet of paper. I was given a plaster and carried on collating the packs, meaning to put the marked one aside for myself, but then couldn't find it. I handed them out randomly - but found, this afternoon, that I'd got the bloody sheet of paper myself after all. It wasn't very visibly bloody, I'd wiped it, but ... well, I have it, luckily, so no need to apologise to anyone. So lovely to have hot weather. I know we'll all start to complain within days - well, some will, but I won't. Although I'm no good in the sun at all, I'd rather have it than not. And I can go out and about, it's just that I can't sunbathe and I wouldn't choose to anyway. At my advanced age, it's a salutary lesson that the bits of skin that have rarely or never been exposed are still young and unwrinkled, but the ones that are out in the elements look altogether older. Lucky me, that I didn't suntan much and never saw the point of trying, and that I've never had an exhibitionist streak and never cared to strip off at a hint of sun. And that's apart from the cancer risk, of course, which would be high for me, having a fair skin and a number of moles. But I'm afraid I've had to take on another job, though I trust it will be temporary and involve little, if any, work. I'm a trustee of a local - um - trust, which ... oh, start from the beginning. The village church sold a plot of land some 25 years ago and the money was invested and a Trust was set up to administer it. When I was a churchwarden, I was a Trustee by default. A year ago, the Rector and another Trustee left and so, as they really needed someone who knew what was what, I agreed to come on the board again, and be Secretary too. There are only two meetings a year and a couple of letters to write, it's not a big job. But we still don't have a Rector and one of the Trustees is leaving, who happens to be Treasurer and neither of the churchwardens feels able to take that on. There are now only the three of us as Trustees and someone has to do it. And I look so ludicrously capable. I do hope this isn't a long-term thing though, I really don't like being in charge of other people's money. Darlings, I must go to bed. I'm going to the dentist tomorrow - just realised I ate a healthy amount of garlic this evening, whoops - and I must get some strengthening sleep. Toodle-pip, sleep well. Have Blogger and WordPress fallen out? I've written comments on Mig's and Mago's blogs and neither has appeared. I don't know if they're languishing in a spam folder or have vanished altogether but sorry, darlings, I'm not ignoring you but am unable to help it. Tomorrow, three meetings for entirely unrelated organisations. And I'm taking the minutes for two of them, which wasn't very well planned - though the first was arranged in December, the second a month ago, but it's the third, only set a fortnight ago, which actually matters most, but which I'm not minuting - so all three it is. But it means that only one day is messed up instead of three, so I don't really mind. Things I'd like to talk about have to remain confidential, so I'm finding myself stuck for much to say. Maybe I'll try to delve back into childhood memories, because a good many of you seem to like that - but I'm not sure if I remember anything more. I dunno. Maybe one of you could suggest something? Russell has taken to bringing me tea in bed, which is very kind but I rarely drink it. He brings the wrong tea, sadly. I like a range of teas and tisanes and have at least a dozen on the go, but first thing in the morning it has to be proper tea - that is, it could be one of several, such as Earl Grey, Lapsang, Rose Pouchong or, at a pinch, straightforward PG Tips, but not peppermint or camomile tea or, as he's been bringing recently, Rooibos. Is that how you spell it? Redbush tea. It's fine, I quite like it, but it's wrong at that time of day. But after several mornings, it seems churlish to say anything, so I'm just quietly tipping it away and have resolved not to buy any more for a while. I mention it because he's just brought me a cup of tea now. Yup, Rooibos, and the smell of it first thing in the morning has put me off altogether. Fortunately, he went outside for a few minutes, so I nipped through to the kitchen, threw it away and made a cup of Lady Grey instead. I wonder if he's drinking the same - I mean, if he really likes it, I suppose I'll have to buy it again and tell him I've gone off it a bit. I put the tin behind the superior teas yesterday, but he hauled it out again, so it is a deliberate choice. Yesterday, today and tomorrow - and Sunday too, if there's still boxes to be unpacked. It's tough work, being a friend of Z, once I start calling round there's no stopping me. And Roses has to keep buying me chips and cider too. This evening, I'm listening to the Proms and reading the papers. An early night, I think, will follow, so please excuse the short post. The pudding was Eton Mess and the cheese was the local one I mentioned last week. I've promised to send some to Blue Witch, but the weather has been so hot that I was afraid it would ooze out of the box. Besides, I snaffled the last piece for ourselves yesterday - I will get some more next week, BW. It was lovely to catch up with old friends - Paul's two sisters called here a few weeks ago and it was the first time we'd seen them for years. I've seen Paul and Jenny more recently, as I've visited them a few times when I've been staying with Wink, but Russell usually stays at home. Oddly enough, now that Al & co have moved out so that it's a lot less easy to get away, he's talking about holidays and visits. I suppose it's the effect of having retired from auctioneering, but he really could have taken breaks if he'd ever wanted to. I have a feeling he's starting to think he's been missing out, which is a pity, but it hasn't been for want of invitations, particularly from me. Several people have mentioned how fine the delphiniums are this year. I don't know the reason - maybe the cold spring suited them, in that slower top growth let them build up their roots more strongly? Anyway, a few pictures to show you what I mean. It's a two blog day! Yay! 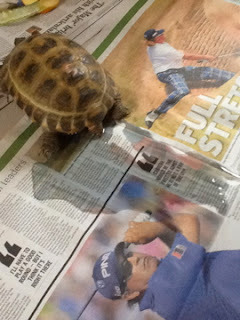 I had to tell you, young Hadrian called round today, with his daddy and big brother, and straightaway wanted to see the tortoise. Who, when picked up, obligingly wee'ed, even as I told the story of the party trick. Ben wasn't thrilled with the muzzle, but realised at once, or so it seemed, that chickens were safe from him. So he trotted off to the field instead. And managed to get it off his schnozzle, but I've tightened it up ready for the next time. This morning, I indulged in a spot of self-pampering - no, loves, please. A mini-pedicure and much lathering on of body lotion. 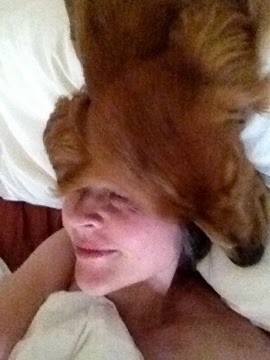 As a result, the dog wanted to lick me. He loves it when someone smells nice. Russell just handed me some very delicious stem ginger ice cream. I'm afraid, terribly afraid, of resultant weight gain, because it could not be resisted. Tomorrow, we have old friends coming for lunch. I haven't decided on a pudding yet. I have chosen the napkins, though. 1 Wink is very pleased to have been put on the waiting list for a new hip, because she's finding it difficult to get about at present. I know what it's like and completely sympathise. It'll probably be November, which will suit her nicely. 2 I feel so mean, I've been to buy a muzzle for Ben. I really want to let him out in the garden, but I'm not having the bantams terrorised and he's got to learn they are not to be bothered. In the meantime, at least he can't pick them up and take them for a jog round the garden. I took him in the car to the pet shop to have the right size fitted, but the assistant had to come out to the car. He's not keen on the car and it takes two people to load him, one for the back and one for the front because he's heavy. 3 I also bought a gizmo called a Shedder, because he's still moulting. It doesn't look as if it does much, but it combs out loose hair in vast quantities. It feels quite scratchy on the hand, but Ben likes it - I suppose it glides over the hair and doesn't scratch the skin. 4 Martina sent me a recipe for an olive oil cake which she thoroughly recommends, though she suggests adding more lemon juice and zest. She also has a recipe for chocolate olive oil cake, I'll ask her for that recipe too. I have no idea what kosher salt is, or what might make it non-kosher. 5 I have been startlingly efficient this morning and dealt with several items of paperwork, which I have sent off by email or post. 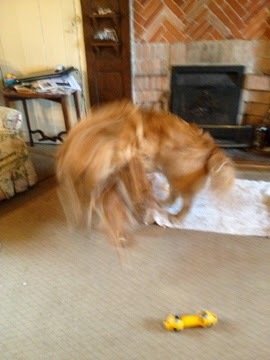 I have also hoovered - but I had to, after using the Shedder. I'm turning into one of those people that scare me, but I'm confident it's temporary. 1 This evening, I'm working on correcting the minutes of the last governors' meeting. I feel Ofsted looking over my shoulder, though when I glance behind, no one is there. I still cover my back at all times, to be sure they're accurate, not only in regard to what was said but what was meant too. 2 I ironed those tablecloths this afternoon. The ironing basket is empty. I feel pretty damn good. 3 I was really tired an hour ago, but whisky and chocolate put me right. We finished the cakes this afternoon, but Martina has sent me a recipe for cake - I'm being led astray. 4 Please think of my sister, who has an appointment for a hip x-ray tomorrow. 5 Fingers crossed for Weeza and Phil, who are expecting to sign the contract to buy the house of their dreams in the next week or two. So, this morning I watered the tubs and vegetables and went to church. One of the hymns, which I hadn't practised in advance, had the wrong tune in the book. In two books. The other two books didn't have the hymn at all. So I warned Sue, who was taking the service, and kept browsing through the metrical index. I finally found it, but didn't have a chance to play it through, of course. "I know what you were doing through the sermon..." she said later. I got through it of course, one of those 'right hand tune, left hand random chords' occasions. I've caught up on the washing! Of course, that happy state of affairs lasts a single day, until one undresses in the evening, but all the same... I'd put on a nice dress, but changed into shorts and a t-shirt later - I know, darlings, none of you has ever seen me in shorts and nor will you, unless possibly on a beach. I'm far too old, nothing sadder than a 1661. In the afternoon, I wanted to watch the tennis, so couldn't possibly be idle all that time - what, me? Idle? Well... (I'm far too fond of the ellipse, I know) anyway, I was resolved to do the ironing. I ironed solidly for five hours. This is what 111 napkins looks like. The ones on the right are the linen ones. I forget how many, over four dozen. Most of the clothes are mine, I keep up with ironing Russell's shirts. I even ironed 14 (sorry, I counted nearly everything in the end, but I had been ironing for FIVE HOURS) handkerchiefs and noticed one that was particularly pretty. So was the next, and it had embroidered initials, CF. When I checked, so had the previous one. Miss Fitt was the old lady I've told you about before, who lived to be 102 and a half. 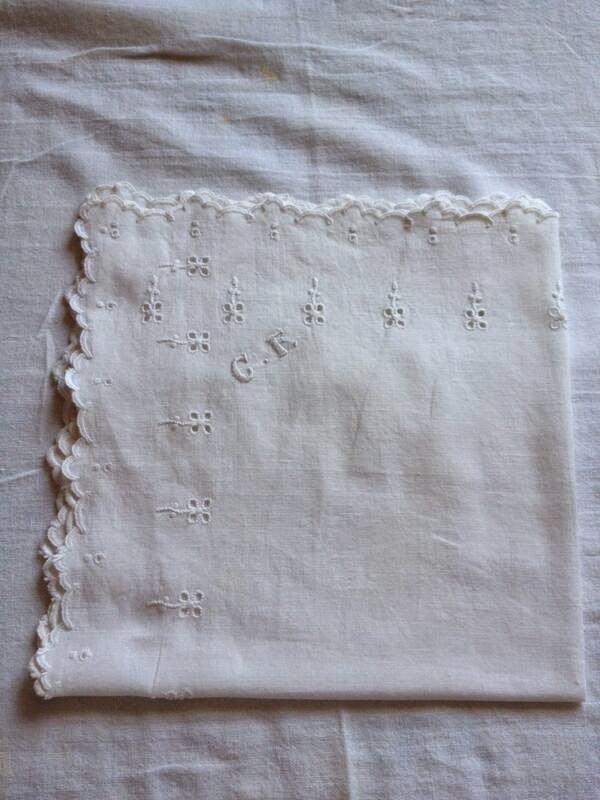 She was an expert needlewoman, even her pocket hankies were exquisite. I'm rather happy to think that I'm still using them, at least 50 years after they were made: she was born in 1882 so they could be Victorian, but she continued to do needlework until she was in her seventies. The final four tablecloths defeated me. Have I mentioned that I ironed for FIVE HOURS? I've re-rinsed them and will part-dry them again, so that I can iron them damp tomorrow or Tuesday. 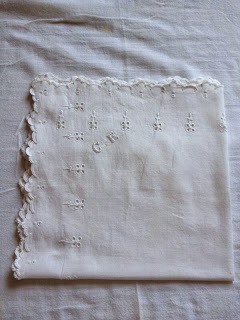 By the way, a tip on ironing napkins that have dried - dampen every other one and make a stack - the damp will work through them all and each one, as you get down to it, will be part-ironed already. And wasn't it a great match? Really fine tennis, very exciting. I was sitting here wondering what to write about when I remembered I had photos. Oh good. I've grown vegetables rather than flowers for many years, but now we just don't need all the vegetables, it being just the two of us here now. 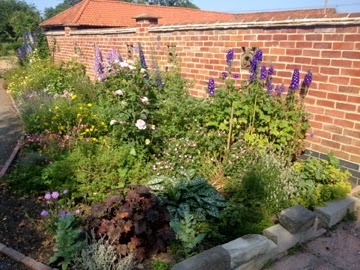 I've been flagging anyway for a while, they're so much work and I couldn't spare time or energy for the couple of hours a day which was the minimum I used to spend in the kitchen garden in the summer. So I've just got a few vegetables this year, have given the veg garden to the chickens for now and have been enjoying the flower bed I planted last year. Please ignore random blocks of concrete in the first picture. My husband can't see any space without wanting to put something there that I don't want. They will stay until I either move them or get cross. 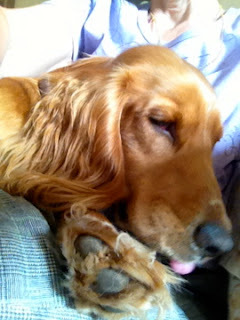 Ben loves to have a cuddle. However, I've moved the sofa from this room into the bungalow (old loose cover finally fell apart and the alternative one didn't go with the other chairs. Actually, none of our armchairs look too good together any more. New sofa will be bought in due course) and there's really not room for the two of us in one armchair. The header photo shows him using me as a cushion, as Blue Witch put it, and these two demonstrate me being his head rest. I had been sitting in that chair until he squirmed me off it, and Russell had to bring me a child's small wooden chair to perch on, which was the right height for Ben's head. It was getting a bit uncomfortable, squatting there once he'd pushed me off. I've just about caught up on the washing. Just three hand towels and a shirt, which don't make up a full load, of course, to go. However, since some linen napkins and tablecloths were involved, I'm afraid ironing will follow. Maybe it'll give me something to do when the tennis finals are on. A couple of beds have still to be made, but otherwise I've even done the housework, which means I won't have much of it to do for weeks. Although we're planning to do some turning out. That is, Russell is in the process of turning out his Room of Mystery (the main mystery is how to get in there, since it is a room with a door but no visible means of opening it), which means he's spread lots of stuff all over the dining table and floor, but it's highly unlikely he'll ever get around to sorting it out. So, when we need the big dining room again, he'll have to shove everything back again and it'll be more disordered than before. Unless I insist on *helping*, of course. I'm still thinking about dreams - you know, there are still a couple of dreams I remember from childhood, and I only realised one of them was a dream years later, when it dawned on my that what I'd seen in it was impossible. And by years, I mean several decades. I'm not the quickest thinker, have to admit. The other one, I did know was my imagination, since it involved a family of bears taking up residence in the kitchen and me levitating up the stairs. Even I couldn't rationalise that. After reading Tim's latest post, it occurred to me that I haven't attempted The Times crossword for several weeks, so I had a go this afternoon, while watching the tennis. I've solved six clues so far, which is about as far as I'm likely to get for the moment. Hopeless. It takes me days to get back into the swing of things. My father was a great crossword solver, one of the sort of people who'd solve the whole thing in minutes. I still have some books of puzzles that he did some of and passed them on to me, so my childish writing is in them too. I normally write the answers in lower case, because he did, and I see that I tried to imitate his style of lettering too. I haven't been out of the house and garden all day today and it's been rather nice. I've got out of the way of just pottering around. You know how it is that hair doesn't seem to grow steadily? One day it's neat or smooth, whichever area we're talking about, and then next it's unbearably shaggy? I'm thinking hair on the head or bearded chin or, in this case, eyebrows. Yesterday - well, they're not exactly groomed but at least they arch more or less where I want them to - they were okay in the morning, but when I went to bed, they suddenly seemed to have bristled. Except they haven't. I've looked in the mirror this morning and they're fine. That means I must have been dreaming again - and the extra clue is that I don't look in the mirror before going to bed. At least it wasn't a nightmare this time, but I've no idea what's going on in my subconscious mind. The night before, there was something that I think really happened, but now I'm doubting, maybe I dreamed that too - I'm cracking up, darlings, it's the heat - at night, at least, until today. I've changed to the summer duvet at last. At least it's not as a result of being too busy, because I'm winding down for the summer. Things are getting ticked off lists, events happen and not much is going in the diary for the next few weeks - well, the week after next is busy but even that is largely social, domestic and pleasure. I still tend to keep to school summer holidays and aim to relax in August - and am very fortunate to be able to do that, of course. And then I wrote a whole lot about schools but I've deleted it, you'll be glad to find. I'm here to waffle cheerfully, it's the Z way. What I'll tell you instead is that I'm jolly glad you didn't eat all the cake at the weekend. 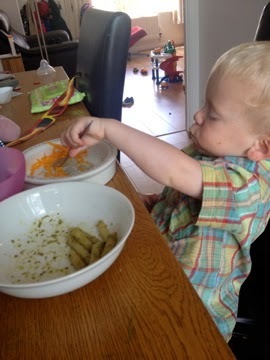 Thanks to Madeleine and Liz leaving the leftovers behind, we've been rather well fed at teatime this week. There's not much left of either of them now. Nor of anything else, except the ham. That's still going strong, but I'll slice it up later and freeze it for later, we can't eat it all yet. I was quite struck, a few years ago, when we went to the New Year's Day party (which always starts with a hearty country walk) of our friends G and A, when Ro met - oh, Ro. This isn't working. When Ronan met Robin. They had known each other since they were two years old, but hadn't met for several years. Very pleased to see each other, they both stepped forward and immediately shook hands. I was frankly surprised that two young men - early to mid twenties - would think to greet contemporaries and old, if not close friends like that. But the handshake isn't showing any sign of going away and nor, I think, should it. Having said that, we've all, or nearly all of us, embraced the kiss over the last few decades and good for us. Although I could digress for a while there and talk about the nuances of a single kiss over multiples, the air kiss, the kiss on the cheek, the hug - but that's one for another post sometime. A few weeks ago, a friend of mine introduced me to her small grandson. No, wait - she introduced him to me, of course (oh, the nicety of who to mention first on these occasions and the number of times I get it wrong, not because I don't know but because I just dive in cheerily without thinking). She was slightly embarrassed, I could see, at having to remind him to shake hands, but he is only four and a little shy. But she's right to insist on it, because it makes it a proper greeting from person to person and doesn't sideline him. It puts us on an even footing and shows mutual respect and, as he grows older, will relieve him of the awkwardness of wondering how a stranger will expect to be greeted. This boy is undoubtedly destined to go to a leading public school and end up something of a big cheese somewhere, but that only makes it the more useful for the children of lesser people like me to know what's what. Pugsley, for example, is going through the slightly awkward phase of being uncomfortable with hugs and kisses unless they're from his parents, but hasn't got the confidence at present to talk his way through a social situation. However, since I started shaking his hand when we meet, he's felt a lot more relaxed and doesn't hang back any longer, afraid I might start kissing him because - well, grannies are bristly and smell faintly of wee, don't they, by their very nature? And, I hope, he will gather that it is never an incorrect thing to do when meeting someone for the first time. Although I do look forward to the day he is less self-conscious and gives me a hug, at least. I'm sounding very formal and, if you have met me, you'll know that I'm not at all. However, slight formality, like etiquette, is meant to ease things, not make them more difficult. And impressions do matter - and do I have an example? Dear hearts, what I say is normally evidence-based. When the high school converted to academy status, the Head thought it was a good time to introduce - well, not a dress code as such, but an expectation of suitable dress. Most teachers already dressed professionally, but some were quite casual. He reckoned that jackets and ties should be the norm for the men - after all, they are for the pupils. This caused no controversy, it was appreciated that it sets a good example. But not all the more senior teachers were quite comfortable. A few weeks into the term, I bumped into one, who I'd never seen in anything but casual clothes, wearing a dark suit and I remarked on how smart he looked. I know him reasonably well (back to modes of greeting: outside school, we'd greet each other with a kiss on the cheek), enough to make a moderately personal remark. He said gloomily that he'd bought a new suit, doubling his formal wardrobe. The next week, I saw him again at a meeting and he came over to talk to me. He'd always hated wearing a suit, he said, he felt self-conscious and it put a barrier between him and others, or so he felt. But now he'd taken to wearing one daily, he realised that people who didn't know him very well saw him differently - that is, he was treated with more respect, listened to more closely, was being treated as a person to be reckoned with - which he certainly is, I've got the utmost respect and liking for him. But if it had taken a clever and able man until his early fifties to realise this, it's not surprising that the average teenage pupil at a comprehensive school doesn't get it either. Which puts them at a disadvantage at interviews, for a start. Whether it should or not is another matter. It simply does. Equality means going up, not down, because people form judgements whether they know they do or not. 1 The visit went well, my October travelling companion was delightful and gave me a delicious lunch. So that's all right. 2 I'm sitting here looking at a vase of dead flowers. I feel rather like Morticia Addams, which I don't mind at all. I was brought up on Charles Addams' cartoons and have always relished the sardonic and macabre. 3 I was woken after a couple of hours by a nightmare last night. It was dreadful. I read and played games on my phone for some time to distract myself before trying to sleep again but, although the shocking bit was brief, I can't forget it. I shan't dwell on it though. 4 I had a chat with Elle (a student from Germany who stayed with us for several months over the winter) this evening, which was lovely. I do miss her, she became like a granddaughter to me. 5 Al and Dilly came over with the boys as usual on a Tuesday while Squiffany is at Brownies in the village hall. Pugsley does not care for kisses at present, so we shake hands. Hay came to kiss me goodbye, then saw his brother shake my hand and came forward again, proffering his hand to be shaken too. Then he kissed me again. It was adorable.